To check and track Voter ID Card Status first log onto official website of your respective state, Search in “Google”to open the official site of state. Application Id / House Number. Form – 8A (Transpose your card). • If application is pending, status will be “Application is under verification”. Part No and Serial no where your name has been enrolled. 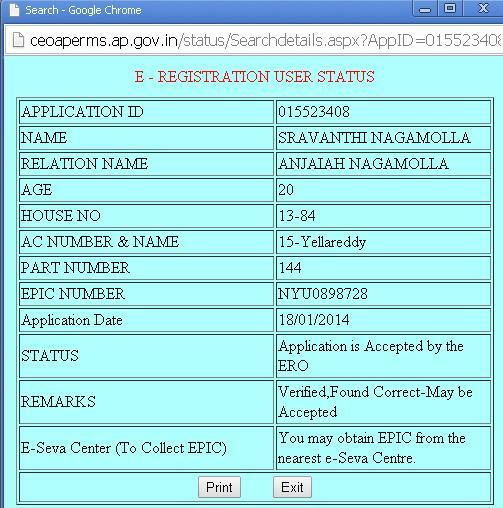 o If application belongs to GHMC area, E‐Seva center details will be displayed where also you can get your EPIC card. o If application belongs to districts other than Rangareddy & Hyderabad it will not display the e‐seva center details. You can get your EPIC card from the e‐seva centers to which your Assembly Constituency is attached. The e‐Seva center details are available at the right side of the homepage. If Any option is not working in official website, that means is official stopped for certain period. If you entered your details then your details are visible in voter list. Then Officially you can pick your voter id directly in e -seva center with nominal fees (below 50Rs). january month of this year i went to get my voter id card at vidyamandir school,meyyanur salem,tamilnadu ,I waited there until 12.30pm but not received but they have given me a phone number of salem suramangalam office ,I called them and demanded whether they have receive the card or not, he said that he had not received,please do the needful to get my card.Thankyou. please go to contact us , you find the toll free number to know your status..